Amid political transitions in the United States and South Korea, the DPRK has set an ambitious goal of completing the development of ballistic missile capable of reaching America by year end. MOSCOW (Sputnik) — North Korea seeks to complete the development of an intercontinental ballistic missile (ICBM) by the end of 2017 or in early 2018, a former North Korean official said Sunday. "North Korea has set the goal of developing miniaturized nuclear weapons that can fit atop a missile capable of reaching the U.S. by the end of 2017 or early 2018 as it takes into account political transitions in South Korea and the U.S.," former minister at the North Korean Embassy in London Thae Yong-ho said in an interview with Yonhap News Agency. He added that the success of ICBM tests would depend on South Korean and US response to the issue. In his New Year's message, North Korean leader Kim Jong-un said that his country had almost finished developing a long-range nuclear missile. 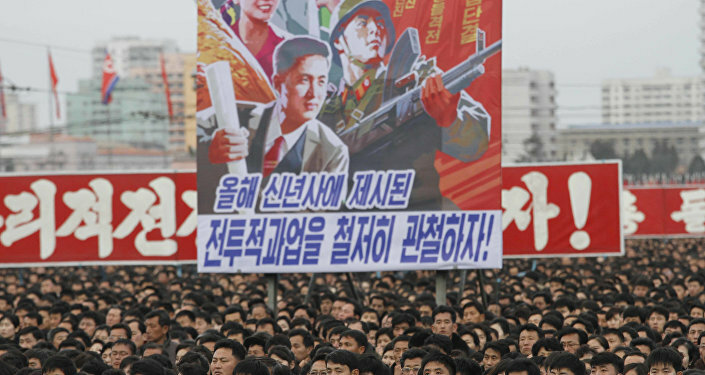 On Friday, media reported that thousands of North Koreans gathered for a rally in Pyongyang to show their support for Kim and his nuclear program. On September 5, 2016, Pyongyang launched three ballistic missiles in the direction of the Sea of Japan. Several days later it said it had conducted a successful test of a nuclear warhead, which is believed to be the fifth and largest blast since Pyongyang began pursuing nuclear and ballistic missile programs. North Korea's nuclear tests have been the source of concern for its close neighbors, Japan and South Korea, and have been criticized by different other states and organizations around the world. In 2016, the UN Security Council held 9 emergency consultations in response to Pyongyang’s nuclear test and ballistic missile launches. US May Impose More Sanctions on North Korea for Missile Program - State Dept.